I recently had two of my Bushnell trail cameras stolen and was looking for a less expensive alternative with which to replace them. 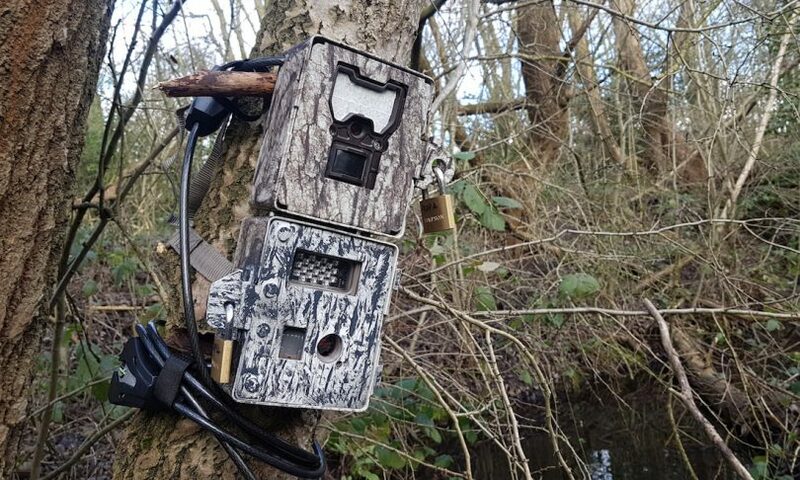 The five cameras that I had were Bushnell Trophy Cam HD Essential E2 – they don’t actually make these anymore, as new models of trail cameras are constantly being released. The new model of the E2 is the E3, retailing (at the time I was searching a few months ago) at around £185. With the replacement security boxes coming in at £46, cable locks at £23, memory cards at £11 and alkaline batteries for each unit at £16. At £281 per unit to replace, I was reluctant to put more cameras out. I’d already lost £562! After researching alternatives, I was seriously tempted to purchase the Cuddeback E3 camera. They retail in the UK at £239.93, but I knew that I was spending Christmas in Florida and that I could pick them up for $150 (Equivalent of £107 each!). My rationale was that anyone seeing the cameras would, with enough intent, be able to steal them should they decide to. The only theft or vandalism that the security cases provided protection against was the opportunistic variety. I knew that someone had actually gone home and come back with wire cutters to steal one camera, and there was nothing to stop them doing so again. Was it not better, then, to put out a less expensive camera without spending the extra money on a security box? Rather than losing £281 per unit, the risk of £107 seemed a lot less of a sting. I decided to buy two units and try them out. This is my review of how they have fared upon field testing, side-by-side, against the Bushnell Essential E2. For the purposes of the field test, I had the remnants of my Aggressor security box adapted to house the Cuddeback. I should point out that one of the main selling points of the Cuddebacks for me was the lack of ‘burn-out’ on its close-range footage. I am looking to undertake a study this spring of pelage using still images, and burn-out is something I’ve been struggling with (animals at close range appear bleached white, making identification of pelage markings impossible) and as such, I had (on advice from the Twitterverse) covered the powerful IR emitters on the Bushnell with masking tape. I realise that this does not create an entirely unbiased comparison, but I was not doing the comparison altruistically, but rather, was trying to find the most effective real-world solution to my problem. Would the Cuddeback E3, at less than half the price of the Bushnell, be a comparable replacement? The following is a review of still images only (video to follow next week) – click on the images to see them full size! It is quite clear from the daytime stills (above) that the Cuddeback is a stronger here when it comes to light levels. The tape on the Bushnell is not darkening this capture, as the tape is over the IR LEDs, which are not triggered in daylight. However, when I look at these really closely, I can still see a sharpness in the Bushnell image that simply isn’t present in the Cuddeback image. I was expecting the opposite to be true, as the Cuddeback images are 20mp, whereas the Bushnell images are 12mp. However, it was night-time images that I was really concerned with. One of the issues that you get when you set out cameras in tandem is when the light emitted from both units is picked up by each camera. This doesn’t always happen, as the sensitivity of the PIR will vary, and the field of view will be slightly different because of the camera positioning. However, this is how each of the cameras fares when dealing with the flash of the other. Again, at first glance, these images seem to be similar, but the sharpness of the Bushnell image is obvious when viewed at full size. Another interesting thing is that the light from both cameras seems to be relatively equal as picked up by the other, but we know that there is masking tape over the Bushnell, indicating that the IR on that unit is much more powerful. Again, the Bushnell wins out, but in three significant areas: brightness, clarity/sharpness and depth of field. I think this image, in particular, is the one which illustrates the difference the best. From the same range, and even with the Bushnell’s IR LEDs taped, the Cuddeback just doesn’t stand up. This image is the type of thing I’m after – badgers moving away from the camera, showing their tail, which I then analyse (along with any other information I have about the individual). For the purpose of this activity, both cameras do the job – I can easily see that this badger has a slim, tapering, pale tail, which is enough for me, in spite of the Bushnell image being clearly brighter and sharper. 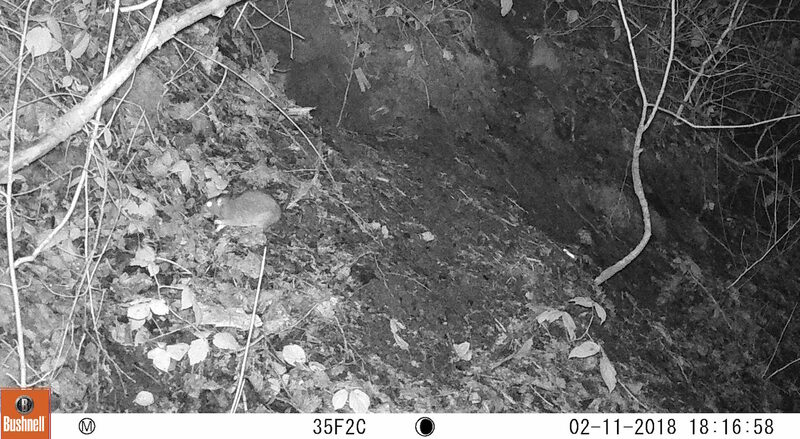 The above photo is one of many captured by the Bushnell of rats. At the same range, the Cuddeback PIR was not sensitive enough to pick up rats once. However, this could prove to be advantageous as it is likely to reduce false triggers by small mammals, wind, rain and vegetation. The Cuddeback (like some of the more recent Bushnell units) can be set to record video AND photo, which allows you to get still photos that you want but still to capture behaviour. The Cuddeback still images are in widescreen, which they are not in the Bushnell. If I were NOT looking to do a detailed study of close-range pelage, I would certainly consider investing in some more Cuddebacks. At half the price, they are more than half the camera. But I’m just sold on the quality of images from the Bushnell. I’m going to experiment with opaque sellotape rather than masking tape to find my perfect level of opacity, but for now, I’m sticking with the E2s for my pelage study. A couple of last thoughts – I had a nearby (taped) Bushnell set to record video on the bank above the sett. The Cuddeback below was set to record single photos, and the Bushnell to record triple photos. So, if you take a look, you’ll see a single, bright flash (Cuddeback) and multiple slightly less bright flashes (Bushnell). These Bushnell flashes will be greatly reduced because of the masking tape, but I just found it interesting that the Cuddeback clearly has a bright LED, which makes me think that in spite of the strong light source and high megapixels, it must be the in-unit camera itself that is where the difference in quality lies between these two units.